More and more Palestinian women want to blow themselves up in attacks on Israel. But are they really choosing to die? 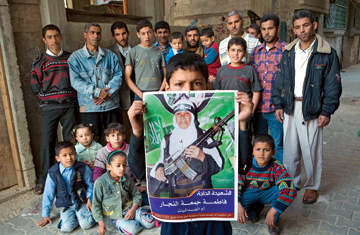 A family member holds up a picture of Fatma Omar An-Anajar, the oldest Palestinian sucide bomber. An-Anajar blew herself up in Gaza on November 23rd, 2006.